The National Weather Service says the freezing rain remained north of the Southern Pennyrile during the early morning hours. 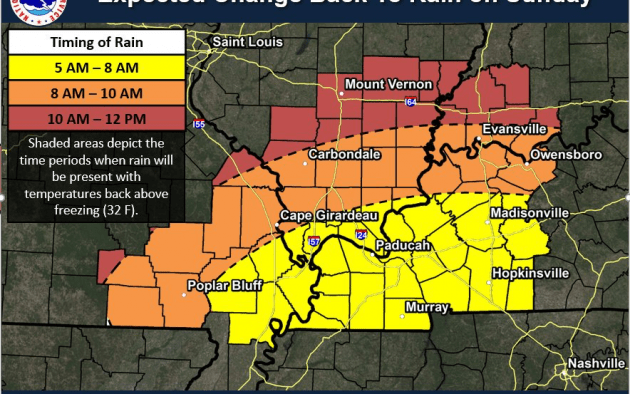 According to a statement released early Sunday morning by the National Weather Service in Paducah freezing rain has caused a light glaze to form on most surfaces generally along and north of a line from Sikeston, Missouri, to Metropolis, Illinois and Central City, Kentucky. The area south of that line mainly received rain, with temperatures across the Southern Pennyrile ranging from 32 to 34 degrees at Kentucky Mesonet locations in the early morning hours.